Now there is an easy way to Finance with NO credit check..
Am I at least 18 years old? Do I earn at least $1,200 of monthly gross income? Do I have an active checking account which has been open for at least 60 days? Visit any certified Okinus Retailer. Complete Okinus’ one page application at a Retailer store. Most applicants do not require additional documentation. Sign the lease agreement – e-signature option available. Schedule delivery of your merchandise or take it home with you. What is a lease-purchase program? Okinus’ lease-purchase program allows you to obtain the merchandise you want when you need it without having to pay the cash price up front. Okinus purchases the merchandise from the retailer for you and you lease it from Okinus over the term of the lease agreement. Just make your regularly scheduled payments and you will own the merchandise at the end of the lease term. You may also choose to exercise your early purchase options at any time. Just click here and follow the onscreen instructions. What type of merchandise qualifies for Okinus’ lease-purchase program? Okinus offers a wide selection of merchandise under its lease-purchase program including furniture, appliances, electronics and HVAC equipment. Call 1.800.472.1334 to speak to one of our customer service representatives if you have a question regarding the type of merchandise we offer through our lease-purchase program. I would like to exercise my early purchase option – what are my choices? 90 Day Early Payment Option – Pay off the cash price amount of the merchandise within the first 90 days in any manner that is convenient; for example–weekly payments, 3 payments or a lump sum. 90 Day Discounted Early Payoff – Pay off the cash price amount of the merchandise plus 5%, 10%, or 15% within the first 30, 60, or 90, respectively. After the first 90 days from your lease origination date; you may exercise your right to purchase the merchandise by paying a percentage of the remaining payments owed (as stated in your lease agreement) plus any outstanding fees. I have poor credit. How can Okinus help me get what I need? Just shop at one of our certified retailers, select the merchandise you want and set up delivery. Okinus will buy the merchandise and lease it to you. You make affordable monthly payments or can own the merchandise at any time with our early purchase options. To find a retailer in your area or to find out how much you qualify for, call us at 800.472.1334. What is the maximum amount that Okinus approves? 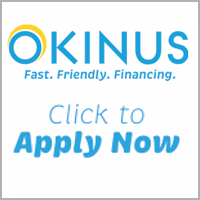 Okinus may approve up to $5,000 if you are at least 18 years old, have an active checking account and earn at least $1,200 of gross monthly income. I notice that certain merchants I visit offer other lease purchase programs – what makes Okinus different? Does Okinus report my payments to the credit bureaus to help me restore my credit? Yes, we do report your on-time payments to the credit bureaus to help you restore your credit. I have done business with Okinus before and would like to obtain additional merchandise through Okinus. Can I do that? Do I pay interest on my lease purchase agreement? Since your agreement with Okinus is a lease, your payment is a rental payment. There is no amount of interest included with your payment. Customers must have an active checking account that has been opened for at least 90 days in order to qualify for our lease-purchase program. What if I don’t have a driver’s license? Can I provide some other form of identification to qualify? Yes, in addition to a driver’s license, an applicant may use an ITIN or TIN number, passport or Matricula Consular card. I am currently unemployed, may I still apply? As long as you have another form of income such as SSI, Disability or Retirement Income. Don’t forget that one of the qualifications is $1,200 of monthly gross income. What if I have filed for bankruptcy – am I eligible to apply? You are eligible to apply as long as you have not filed bankruptcy where Okinus was listed as a creditor. I want to buy furniture today. How do I find an Okinus retailer? You have the ability to locate an Okinus retailer through our Retailer Map or call us at 800.472.1334 today.